Yellow-eyed grass is a small perennial about 8 to 12 inches tall with dark green iris-like leaves and delightful yellow flowers that appear May through June. This charming plant eventually forms clumps that can be separated to produce more plants. This iris relative grows naturally in marshes and riparian areas and appreciates moist, well draining soil. It will become drought tolerant in a conventional garden. Plant in full sun along the coast and in partial shade inland. 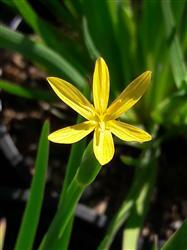 Yellow-eyed grass is great for moist meadow gardens, containers and as accents in borders. Plants may die back at the end of summer to nothing but a bump in the ground, have patience, they should grow back in late winter!